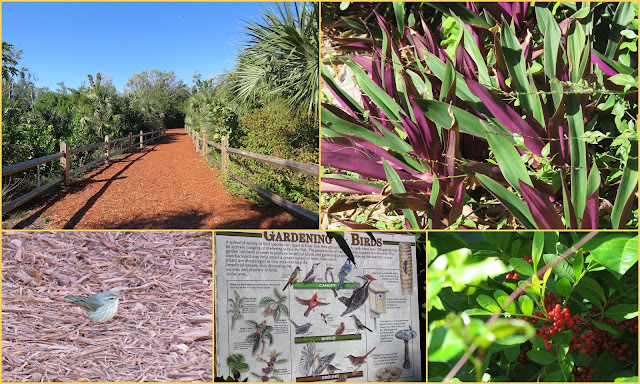 I am taking you back to our Florida trip, on Jan 10th we went looking for a park in West Palm Beach called Winding Waters Natural Area. There are always signs warning about the alligators. A Loggerhead Shrike was a common bird seen at Dyer Park. We saw a large flock of Glossy Ibis while walking the loop trail at Dyer Park. On the left side of the top photo you can see the trail we walked. There must have been hundreds of Swallows, flying over the nearby landfill. This photo looks better if you click on the photo for a larger viewing. We walked a loop trail used mostly by joggers and walkers. Each day we were in Florida we racked up some steps walking. 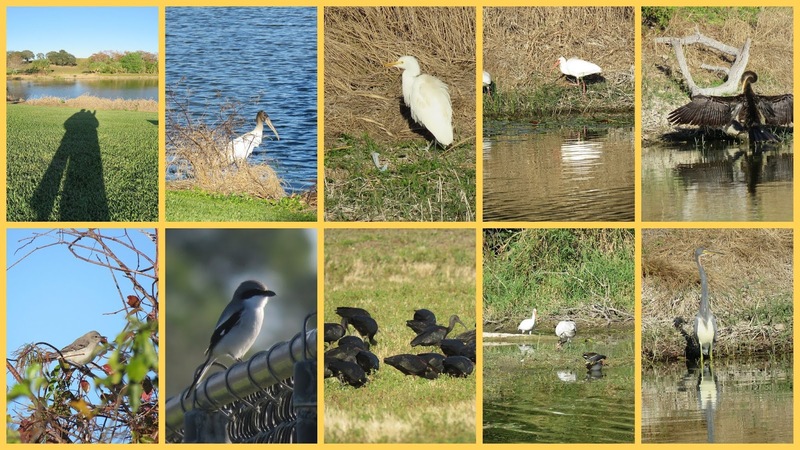 Below are some of the birds we saw during our walk, Wood Stork, Cattle Egret, White Ibis, Anhinga, Mockingbird, Loggerhead Shrike, Glossy Ibis, White Ibis with a Wood Stork and Moorhens and the Tricolored Heron. The Spanish River Park had a nice little nature trail. We did not see many birds, pretty plants a Palm Warbler and some colorful berries. Spanish River Park beach, to get to this beach we had to walk through a tunnel under the road. 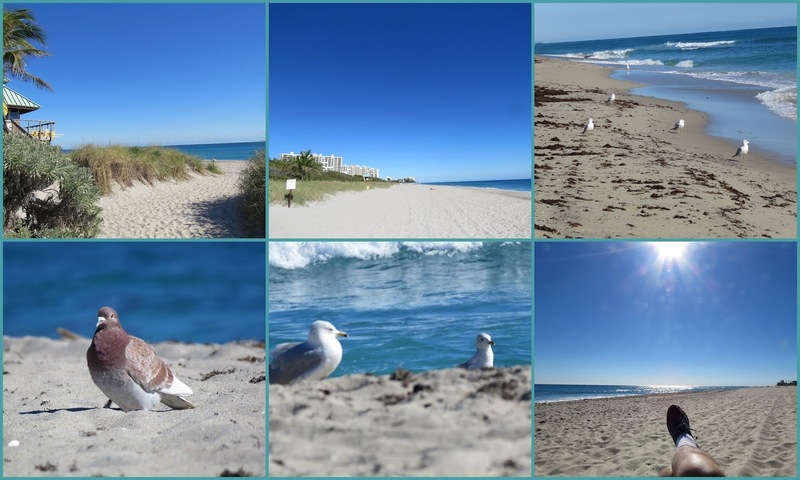 Spanish River Park Beach, Boca Raton Florida. Check out the links, I hope to see you there. Thanks to the hosts today. Enjoy your day and new week. ...a beautiful spot to enjoy nature's beauty! Wonderful shots from Florida. The Ibis looking very pretty, and so many swallows! You obviously really enjoyed your time in Florida and found some great places to walk. The photos are wonderful. I am concerned at what one would do if you met an alligator. Are there park wardens around? Florida is just so beautiful and you have captured it perfectly, postcar perfect. I thought of you at the bank on Friday. I parked with my nose to a pond. when I came out there was a sunning Anhinga, making little sounds, right in front of my car. What fun, many steps, many shutter-clickings! So glad you shared them here...happy week to you! Beautiful bright skies in your photos. 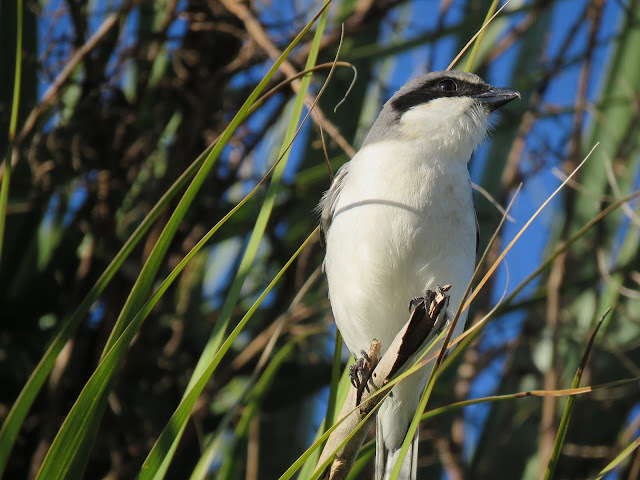 The Loggerhead Shrike is a gorgeous bird and this is the second blog that's featured a photo of it recently. I'd never heard of it before. Happy new week! This is so fun Eileen ... and your travels here in our parttime State put us to shame. Almost every time you blog from here I find a new place to add to our must visit list. This day it is is two! That loggerhead shrike sure is a pretty bird! Wonderful shots! What a great trip that was. Florida has so many wonderful nature areas to visit. It looks like you had a wonderful time walking in the parks to see all the birds and beautiful plants. Glad you did not encounter an alligator! What a gorgeous spot to view all the nature. Fantastic photos! Have a wonderful day and new week. Those Ibis are beautiful. Thank you for sharing these photos today. awwww, birds and more birds. ...been offline...trying to catch up. The best part of visiting Florida in winter is seeing all of the birds. Thanks for showing them to us, Eileen! Great place to be for Jan. 10. Many of those birds will be quite far north now. The Loggerhead Shrike is favourite of mine, lovely Eileen. Beautiful photos but the photo of the Shrike is stunning, what a lovely looking bird. I did enjoy your mosaics too. You always encounter such great feathered friends, Eileen. Much better than gator encounters! Love Florida! Makes me want to become a beach bum. Great birds! So nice seeing all your beautiful photos. Must have been nice taking a break from winter!! Eileen - enjoyed your park and beach, for different reasons. 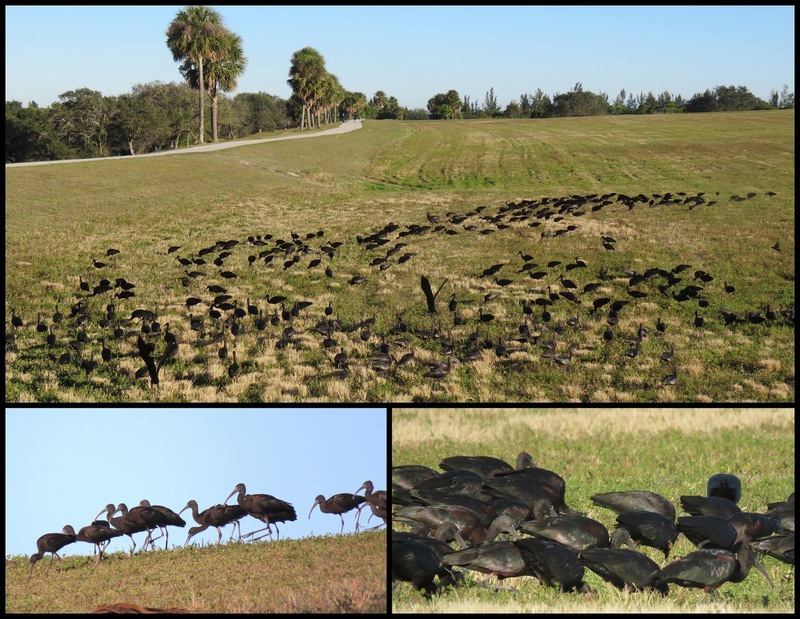 The park was clearly teeming with birds - I cannot imagine that many glossy ibis in one location - cool! Just today I saw a Northern Shrike near our lake - very busy eating insects! The beach looked deserted, just the way I like it! (And glad you did not see any alligators!) Thanks for linking to Mosaic Monday. 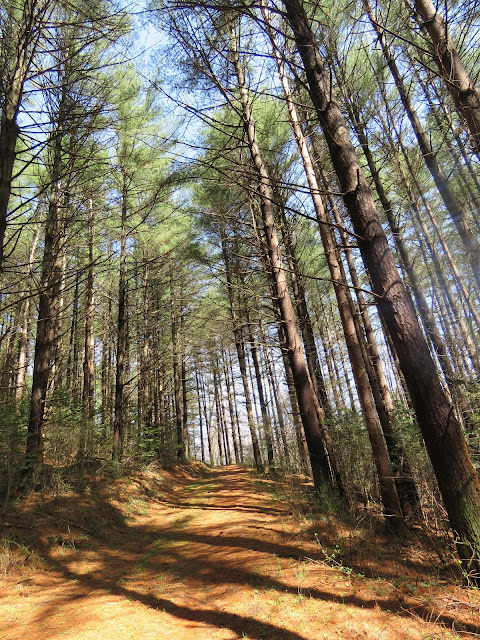 Lovely collages from a nature filled walk! Very nice images, really enjoyable! I am always staggered by the amount of wildlife you see on your walks. thanks for sharing these beautiful views! The Shrike is also among my favourite birds, with that lovely black mask on its eyes! I love the way you introduce me to common birds in your neck of the woods that I have never seen - like that Loggerhead Shrike! Have a lovely week Eileen, happy birding! the shrike is gorgeous, thanks for sharing this bird - one i may never see otherwise!!! That looks like a special place to visit Eileen. 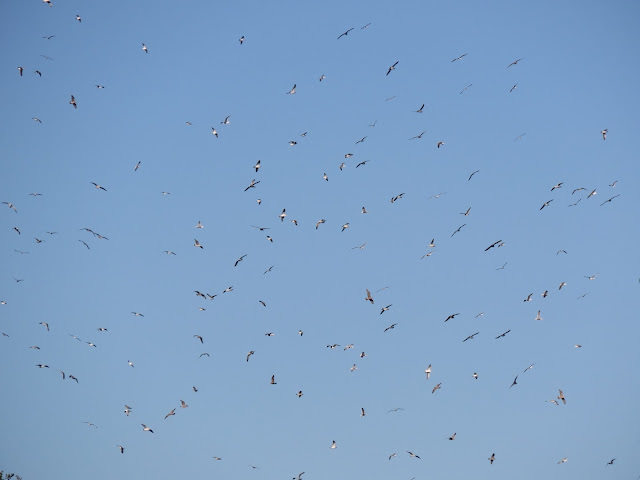 That certainly was a lot of swallows in one place but the Loggerhead Shrike is my favourite today. Ttake care with all those alligators around. Oh my gosh, your second photo is just precious, such a great capture. All of these photos are bringing me right there. Looks like a great place to spend time. Fantastic close up of the loggerhead shrike and the rest of your nature pics too, as always. My sister just got to Florida this afternoon but she's not one for nature except her fascination with gators continues. Beautiful vievs with blue sea & sky - great birds. Have a nice week. You always have the most magnificent nature shots! Lovely! What a wonderfully beautiful place to visit! Me encanta vernir a verte Eileen, y admirar la naturaleza tan linda que compartes. Maravillosas fotos. Those innumerable swallows and the blue sky: gorgeous! That's a great shot of all the swallows in the air! And the beach looks so relaxing.